Previously ravaged by armed conflicts and natural catastrophes, the Philippines are today undergoing a development that is much more promising and encouraging for the future. Children’s Rights have followed a similar trajectory, and while they are far from being fully guaranteed, the country’s openness and willingness to change has given its people hope that soon even greater improvements will be made. In the Philippines, close to 1 out of every three individuals lives below the poverty line, while the country itself is in full economic expansion. Although this is encouraging for the future, the present situation remains bleak for a great many households. Poor families frequently suffer from hunger or malnutrition from which follow numerous health problems, particularly among children who are physically more vulnerable than adults. 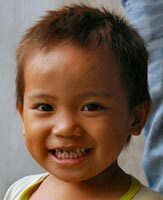 The infant mortality rate is particularly high in the Philippines. Furthermore, more than 1 out of every 5 newborn children exhibits dietary deficiencies from the moment of birth. Childbirth is risky both for the infant and for the mother. In fact, the number of mothers who die during childbirth remains considerably high—especially since many young girls, through lack of both information and contraceptives, face unwanted pregnancies. Furthermore, access to healthcare remains difficult in the country’s more remote regions. Of course, it is in these areas that undernourishment and resulting problems are the most virulent. Finally, no one takes responsibility for children who suffer from mental health problems. They remain marginalized and do not receive the appropriate care. 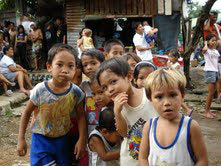 More than 10% of Filipino children are compelled to work so as to support the needs of their family. 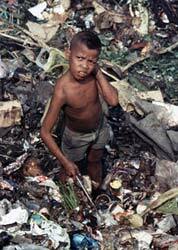 Close to a million Filipino youths work as garbage scavengers in public dumps. The working conditions are utterly filthy and often have serious effects on the health of these individuals. Other children find employment in rural sectors. They work nonstop on sugar, rice or tea plantations as the case may be. Filipino youths also work in their nation’s fishing sector which is highly developed. 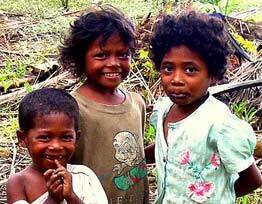 Children born out of wedlock : They are the object of considerable discrimination in the Philippines. The law, for example, still refers to them as “illegitimate” children—a term that is largely negative and unjust, seeing how they did not choose to be born under such conditions. Furthermore, their right to an inheritance is considerably limited. They clearly do not stand on equal footing with children born to married parents. Native People : The children of these minorities are frequently the victims of racist acts, nor does legislation protect them. Their opinions are hardly ever taken into account, although much progress has been made concerning the children of nonindigenous peoples throughout the country. With regard to education, healthcare or even the right to life, indigenous children are routinely treated less favorably than others. Young Girls : They too are unable to fully enjoy their rights. Young girls are the object of notorious discriminatory practices that often continue throughout their entire lives. Mentalities must undergo a serious amount of change if the idea of equality between the sexes is ever to become a reality. 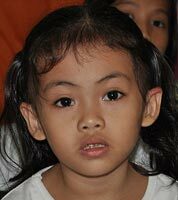 Handicapped Children : They are very numerous in the Philippines, owing to nutrition- and hygiene-related problems. The country has yet to set up a sufficient number of establishments that can adequately attend to the needs of such children. Consequently, their access to educational and healthcare services remains severely limited. The Philippines number among 20 countries in which children are often deployed as soldiers in armed conflicts. Certain armed groups have recently stated that they will no longer use children in this capacity; however, the total absence of child soldiers is far from being verified. Totally prohibited by the International Convention of Children’s Rights, the use of child soldiers is an abhorrent practice whose effects on the health and well-being of children are wholly negative. Such children are caught up in a violent and cruel environment where they are in constant danger of being killed. Their role models are brutal and aggressive men whose influence on their development will clearly be far from positive. 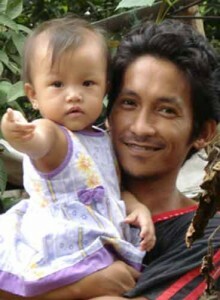 14% of young women in the Philippines get married before the age of 18. One prepares them very early in life for their future role as a wife. However, these marriages often have grave consequences for the health of these young girls who do not understand what such a marriage entails. Corporal punishment is frequently practiced in the Philippines, notably within the family. It is not the object of any explicit legislation. Thus, many children suffer daily from violence at the hands of their parents who treat them in a cruel and humiliating manner. Children are equally the victims of sexual abuse in certain families. These are serious crimes and all too often they are not condemned, nor does the justice system adequately protect children from threats and intimidation on the part of criminals. The Committee of Children’s Rights has expressed profound concern about justice for minors. With regard to armed conflict, there have been numerous executions and extrajudicial imprisonments involving children. The killing of children is a serious violation of the Convention of Children’s Rights; yet the crimes themselves remain unpunished. The Philippines thus needs to make a more concerted effort to put a stop to these practices and to actively see to it that the authors of these atrocities are held responsible for their acts. As it stands, the pursuit of justice in relation to such crimes is insufficient and the results are profoundly deceiving. In addition, there are hundreds of people who are the victims of forced disappearances in the Philippines. When they do return (which is very rare), they suffer from both physical and mental trauma as a result of their experience. Children who are in prison are not de facto protected as they ought to be. Although the country’s legislation forbids inhuman and degrading treatment, numerous reports leave one with the impression that children in prison are still being subjected to torture. 17% of births are not officially registered in the Philippines. The country has made some progress on this issue. However, not all children are able to benefit from these improvements. Indeed, most Muslim and indigenous children still lack an official identity. This leads to great difficulties for such individuals because, owing to their official nonexistence in the eyes of society, they will be unable to enjoy their rights.